Hair woes have reached epidemic proportions. Almost everyone is suffering from something or another, be it dry hair, frizzy hair, brittle hair, premature graying or uncontrollable hair loss. For the most part, you can blame it on diet and the chemical-laden products that we apply to our hair and scalp. Environmental pollution and climate are also one of the many factors. But the mindsets are changing, and people are becoming more conscious about using organic products. And we too are trying to help you head down the same path. After making some amazing homemade shampoos, it’s time to try your hands at homemade hair conditioners. Washing your hair too often can strip it of its natural oils. Using excessive heat also makes your hair brittle. This is where a hair conditioner comes into action. Made of nourishing oils and ingredients, a conditioner forms a protective coating over your hair and replenishes the hair follicles with essential nutrients. Conditioners also help smooth out your hair shafts and impart a natural sheen to your tresses. Since hair conditioners play a vital role in maintaining your hair health, it’s important that we stick to organic and non-toxic ingredients, some of which are household staples. 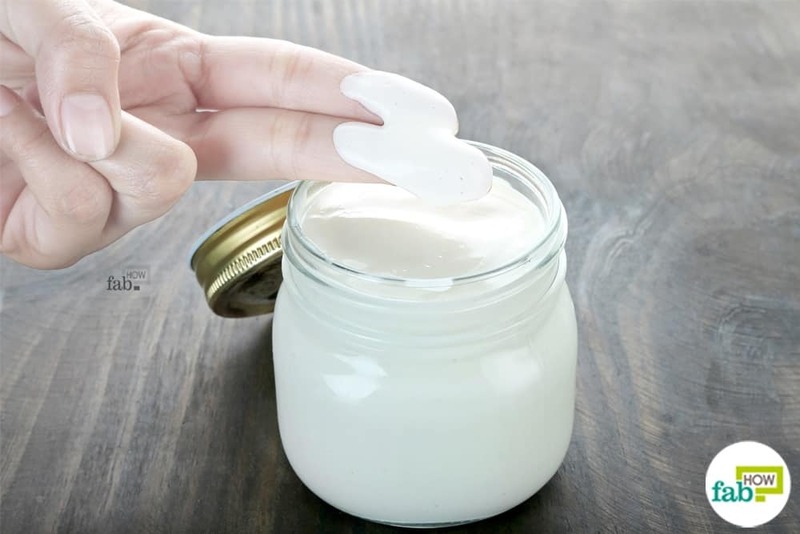 We did some trial and error testing to bring you seven easy yet effective DIY homemade hair conditioner recipes that are surely going to transform your limp hair into the luscious locks that you always desired. 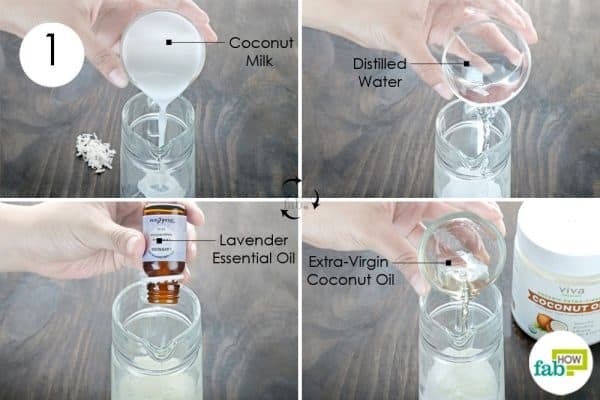 Coconut milk is great for both your hair and skin. This conditioner recipe uses a combination of coconut oil and coconut milk, along with lavender essential oil. The coconut oil helps cleanse the hair follicles, and its fatty acids restore lost moisture to your hair. The lavender essential oil boosts hair growth and adds an antibacterial layer on the scalp. This conditioner also takes care of dandruff and other scalp infections. 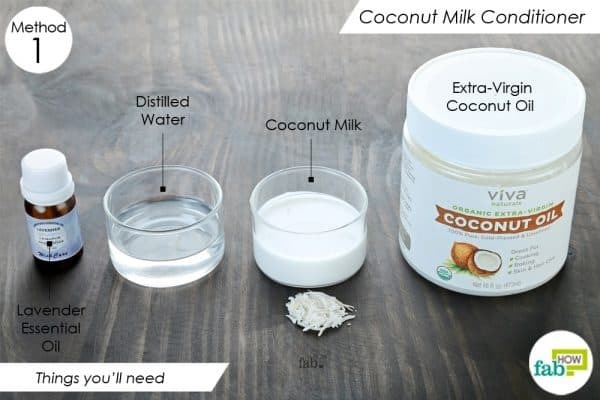 Pour 3 tablespoons of coconut milk into a container. If you wish, you can learn how to make your coconut milk instead of buying it. Dilute the milk with an equal quantity of distilled water. We don’t recommend using tap water, as the impurities in it will shorten the shelf life of the conditioner. Add 15 drops of lavender essential oil as well. Use a motorized blender to whisk the ingredients well. Transfer the prepared blend to a pump bottle. Wash your hair as usual, then soak up the excess water from your hair with a towel. Apply the blend to your damp hair and spread it along the hair shafts. If you have an oily scalp, you can use the conditioner only on the tips. Leave it in for 2 to 5 minutes, then rinse it out with water. Use it each time after shampooing your hair to maintain healthy and shiny hair. The shelf life of this conditioner is 2 to 3 weeks when stored in a dark and cool place. Aloe vera is another natural conditioner that can give you thick and lustrous hair. Rich in essential minerals and nutrients, it replenishes your hair and restores its natural sheen. Aloe vera also has antibacterial and antifungal properties, which help clear up any yeast infection on the scalp. 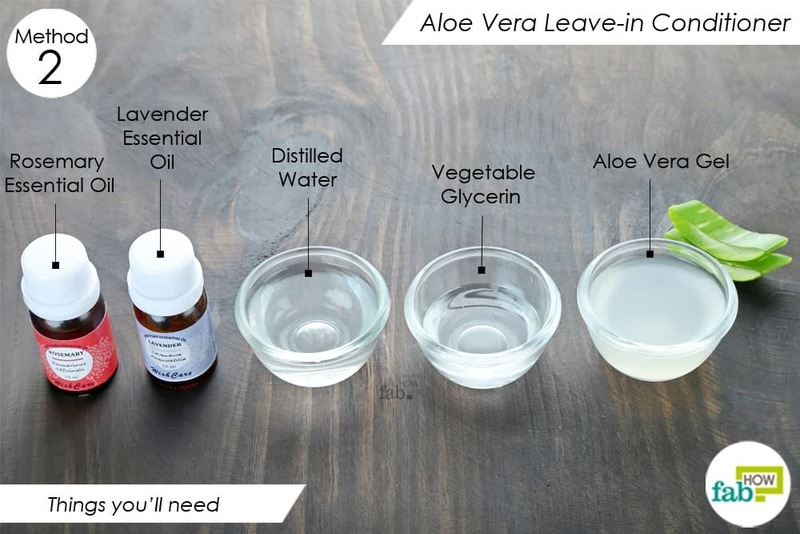 This recipe also uses glycerin that works as a humectant to seal moisture into your hair. We also added rosemary and lavender essential oils, which not only prevent hair loss and boost hair growth but also give the conditioner a refreshing fragrance. Pour 2 tablespoons of fresh aloe vera gel into a container. Dilute it with 2 tablespoons of distilled water. Add 5 drops each of lavender and rosemary essential oils. Use a small stick mixer to blend the ingredients thoroughly. Funnel the prepared mix into a dark-colored spray bottle. 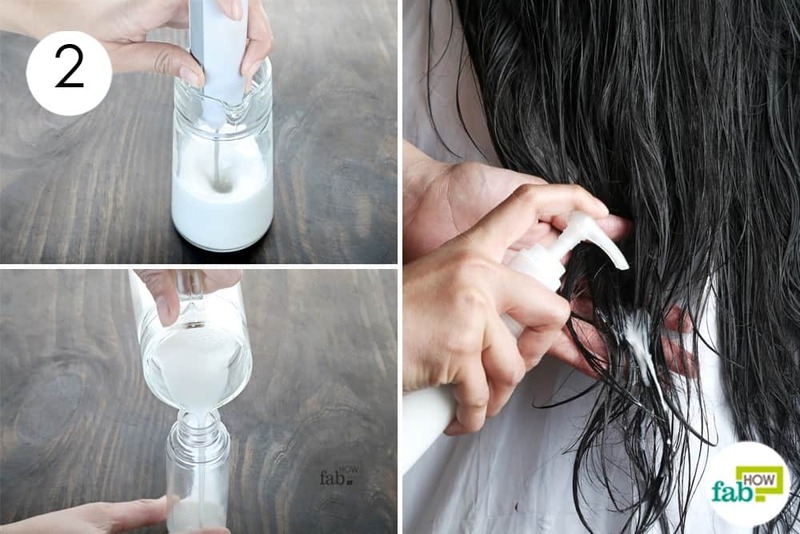 Shampoo your hair like you normally do. Use light mists of the DIY leave-in conditioner all over your hair, especially on the roots. Use it after each time you wash your hair to maintain glossy and frizz-free hair. The shelf life of this conditioner is 1 to 2 weeks when kept refrigerated at all times. 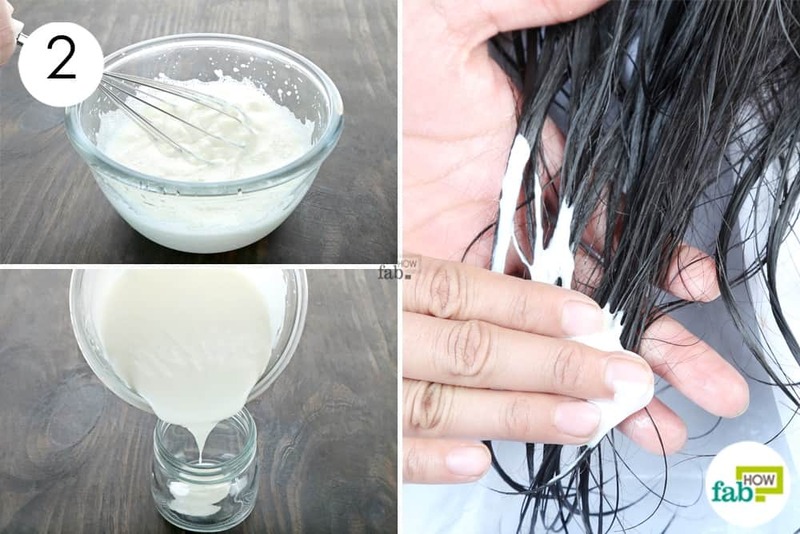 If you have an excessively oily scalp, this DIY leave-in conditioner is just what you need. 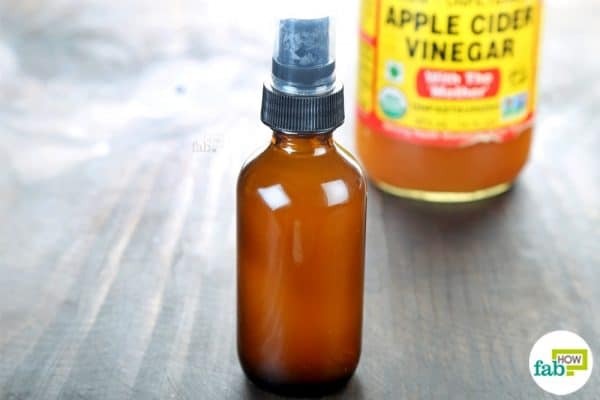 Apple cider vinegar, the variety that includes the ‘mother’ can help restore your scalp’s pH to reduce the oiliness. The nutrients present in apple cider vinegar also make your hair soft and shiny, while the acids in it cleanse the hair follicles to remove any buildup of dead skin cells and hair products. This conditioner also uses lemon essential oil, which forms an antibacterial layer on your scalp and also controls oil secretion. Note: If you are worried about the strong vinegar smell, rest assured that it will dissipate as your hair dries. 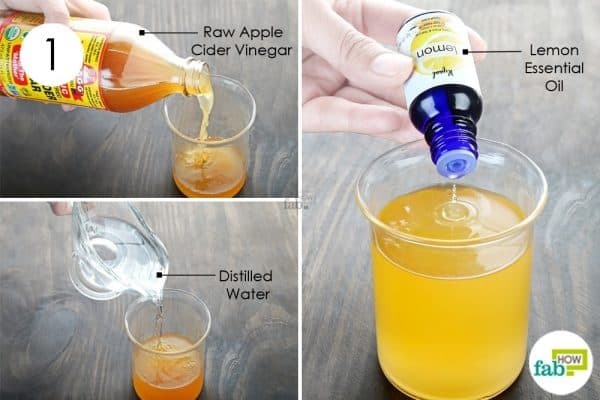 Pour 1 tablespoon of apple cider vinegar into a container. Add ½ cup of distilled water to it. Distilled water extends the shelf life of the conditioner. Add 7 drops of lemon essential oil as well. Use a motorized blender to whisk up all the ingredients. Use a funnel to pour the blend into a spray bottle. Shampoo your hair like you normally do and soak up the dripping water with a towel. Spray the prepared conditioner all over your damp hair and allow it to air-dry. Use this conditioner 2 or 3 times a week to control an oily scalp and maintain fresh and glossy hair. Store it in a cool dark place up to 2 to 3 weeks. Dry hair is more prone to frizziness and breakage. Using a honey-based hair conditioner can help smoothen your hair without making it oily. 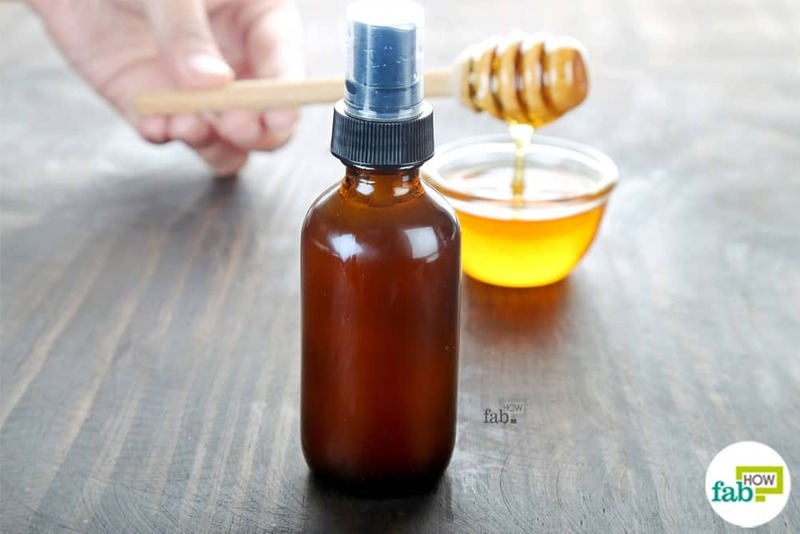 Being a natural humectant, honey can be used for healthy hair in a number of ways to seal the moisture into the hair shafts. 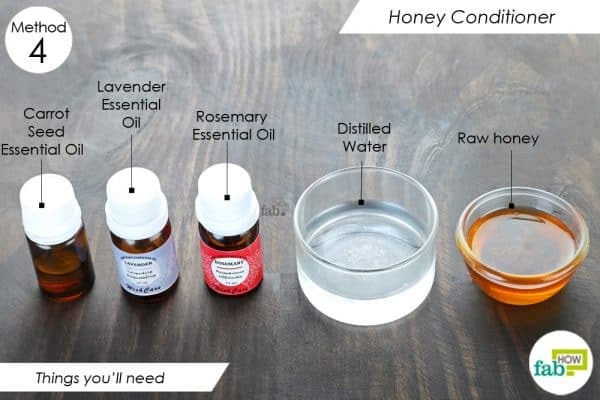 Along with honey, this DIY conditioner contains a mix of lavender, rosemary and carrot seed essential oils that enhance the antibacterial and moisturizing properties of the blend. These therapeutic oils also improve hair growth and prevent scalp infections. Pour 1 tablespoon of raw honey into a container. 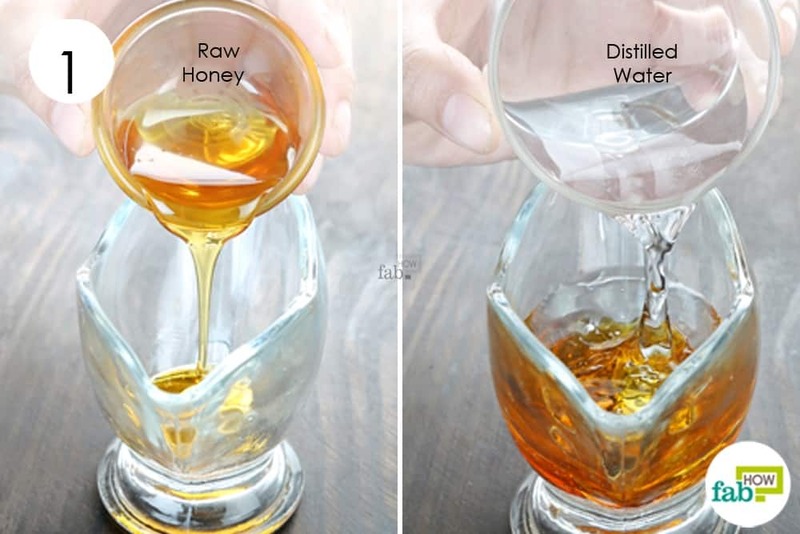 Add 3 tablespoons of distilled water and mix well to dilute the honey. Using distilled water extends the shelf life of the conditioner. Add 2 drops each of lavender, carrot seed, and rosemary essential oils. Use a motorized blender to whisk up the ingredients. Funnel the solution into a dark-colored spray bottle. Shampoo your hair as usual and soak up the excess water with a towel. 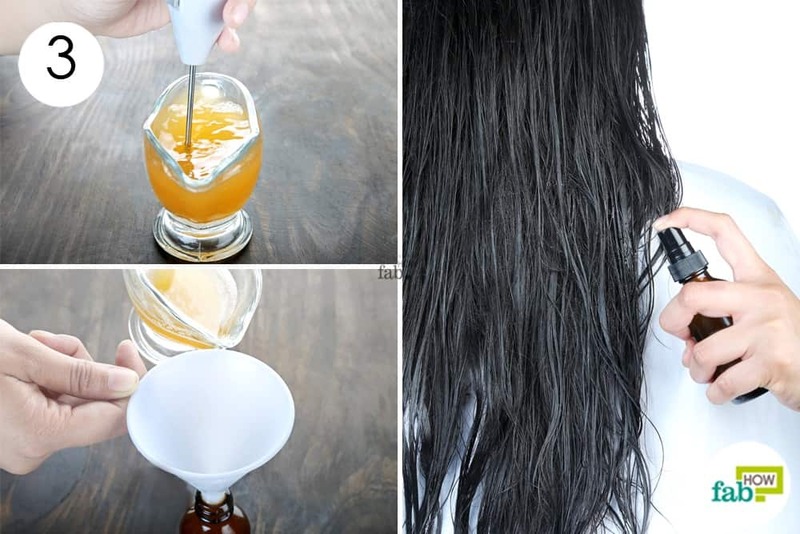 Spray the honey conditioner all over your hair and scalp. Massage the blend into your hair. Wait 5 minutes, then rinse it out with cool water. Repeat 2 or 3 times every week or whenever you wash your hair. The blend will last for 1 to 2 weeks stored in a cool place. This enriching hair conditioner is for you fashionistas who have damaged your hair by dying it a bit too often and frequently using heat styling tools. Since hair is made of keratin protein, eggs help fill the keratin gaps in damaged hair. Eggs also give your hair a natural gloss. This conditioner also uses mayonnaise, which is like a ready-to-use mask for silky hair. It contains egg yolks, oil, and vinegar that help deeply condition your hair and repair the damage. It also uses egg whites for an extra dose of proteins and yogurt to help cleanse the scalp and get rid of scalp infections, if any. The vinegar in the mayonnaise also helps restore the pH of the scalp. 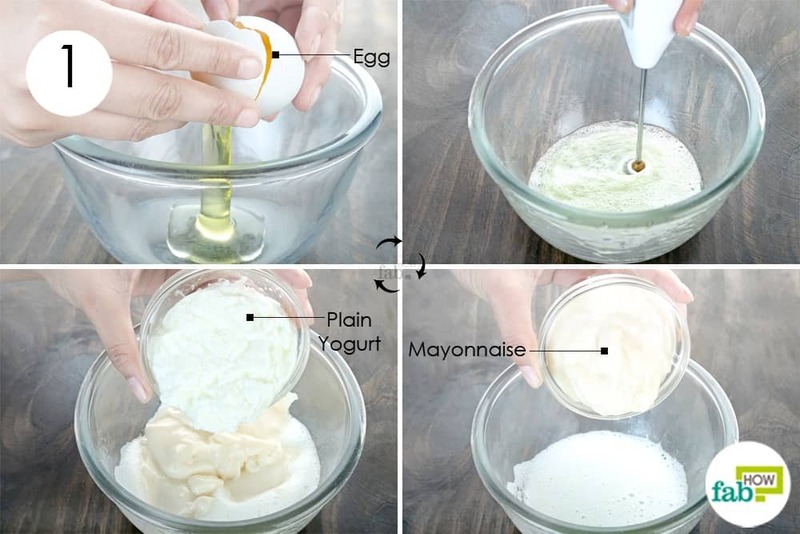 Crack an egg and collect the egg whites in a bowl. If needed, see our hacks for separating egg whites from the yolk. Use a stick mixer to whisk the egg whites until they turn frothy. 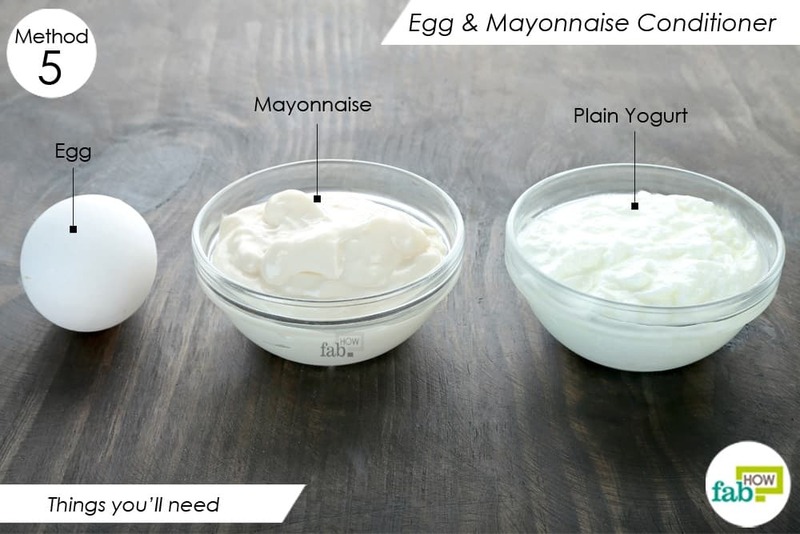 Add ½ cup each of mayonnaise and plain yogurt. Use a whisk to blend all the ingredients into a smooth, creamy paste. 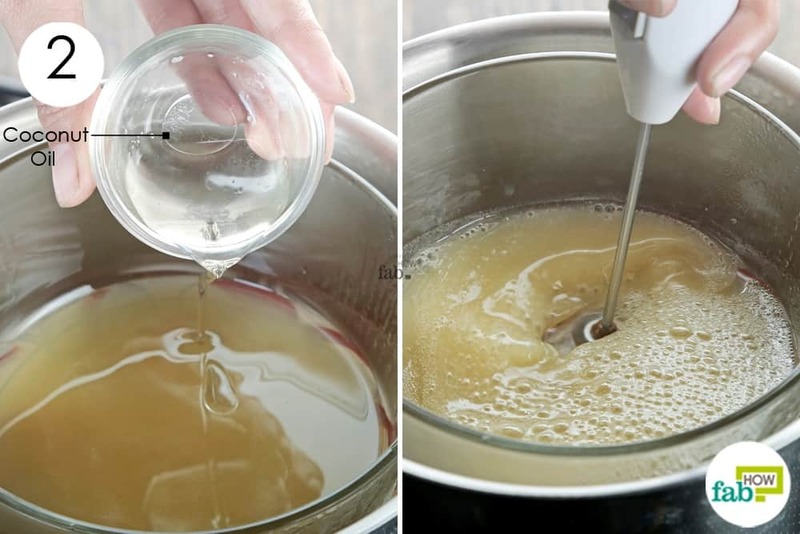 Pour the mix into a glass jar for storage. Wash your hair as usual and apply this blend like your regular hair conditioner. Leave it on for 5 minutes, then rinse it out with cool water. Use it twice every week to repair your damaged hair. The shelf life of this hair conditioner is 1 week when stored in a dark and cool place. Not only do they smell great, but essential oils can also deal with most hair troubles, without leaving any product buildup on your scalp. This conditioner uses the best of the best essential oils to make your hair healthier, give it a nice sheen and boost your hair growth. It also has apple cider vinegar that helps normalize your scalp’s pH and nourish your hair with essential nutrients. The glycerin in the conditioner works as a humectant to absorb moisture from the air and lock it into your hair. 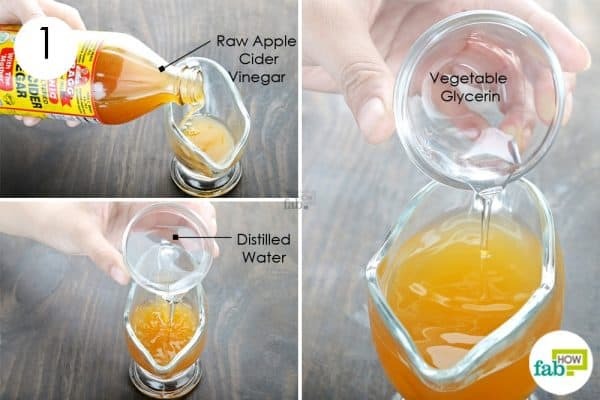 Pour 4 tablespoons of raw apple cider vinegar into a container. Add 4 tablespoons of distilled water to it. Add ½ teaspoon of vegetable glycerin. 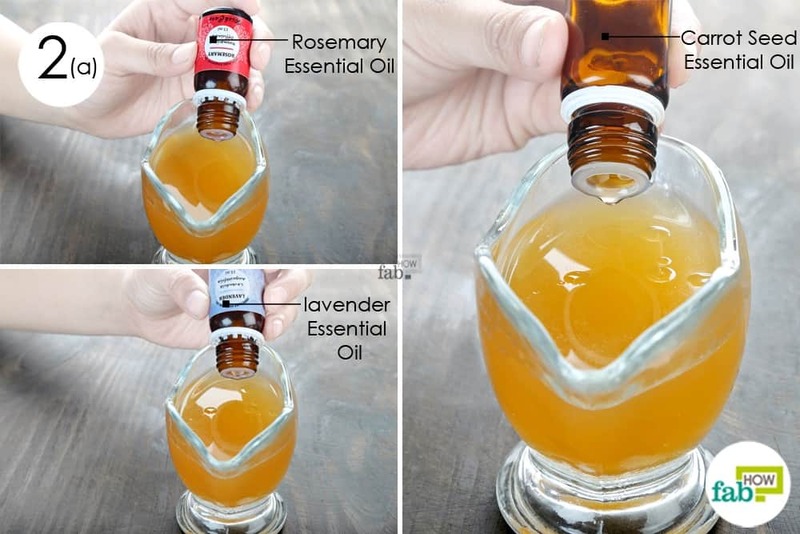 Add 3 drops of rosemary essential oil. 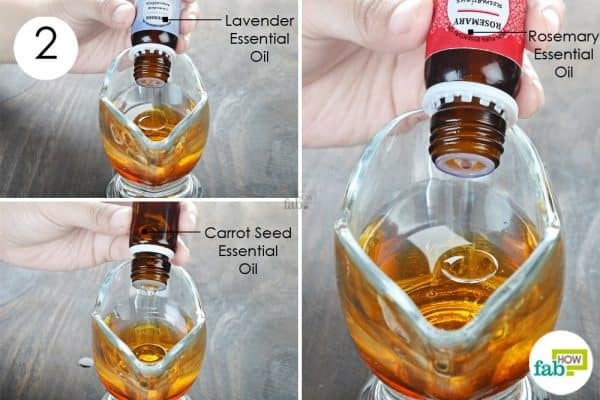 Add 2 drops each of lavender and carrot seed essential oils. 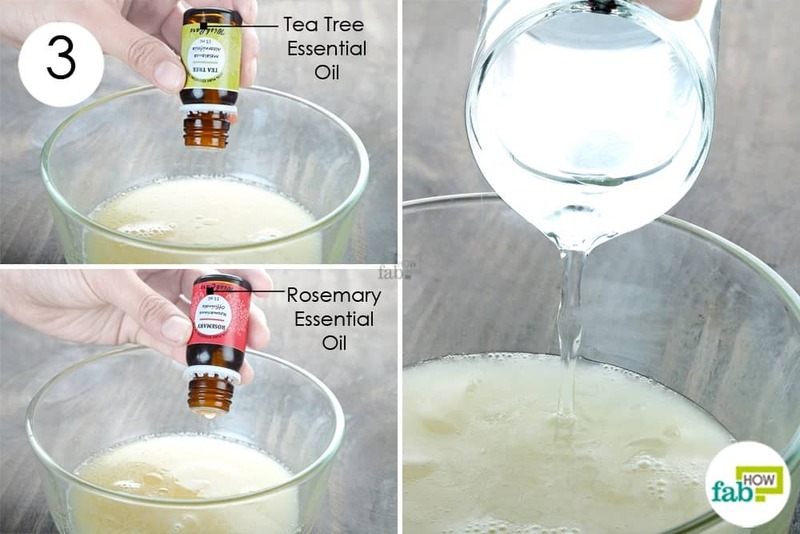 Add 1 drop of tea tree essential oil. 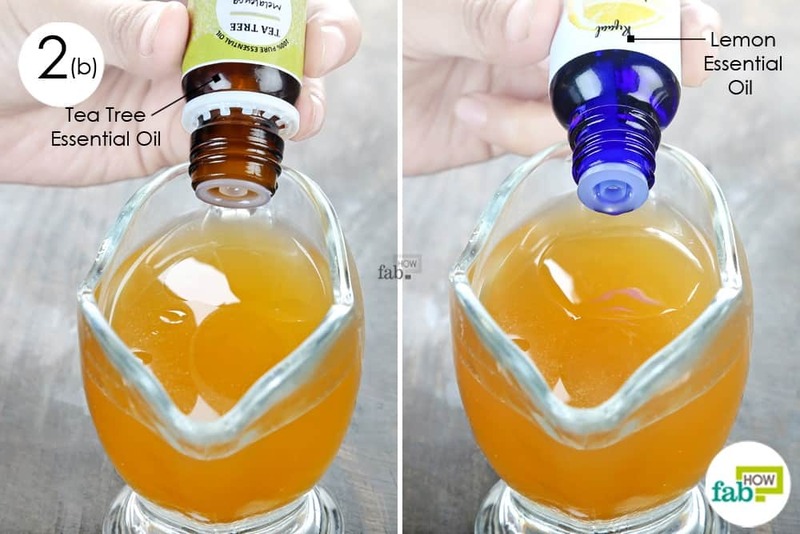 Add 2 drops of lemon essential oil. Funnel the blend into a dark-colored spray bottle. 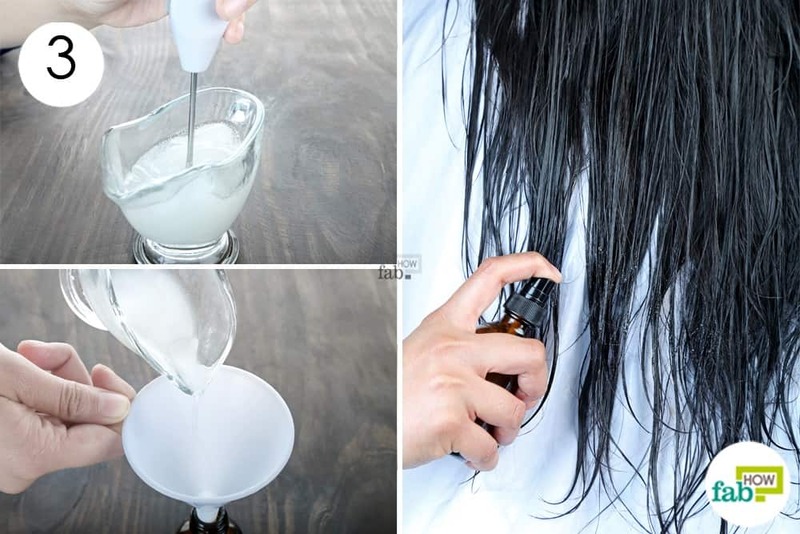 Spray the conditioner all over your hair and scalp. You can either leave it in or rinse it out after 2 to 3 minutes. Spray the concoction on your hair each time you wash it to maintain healthy hair. 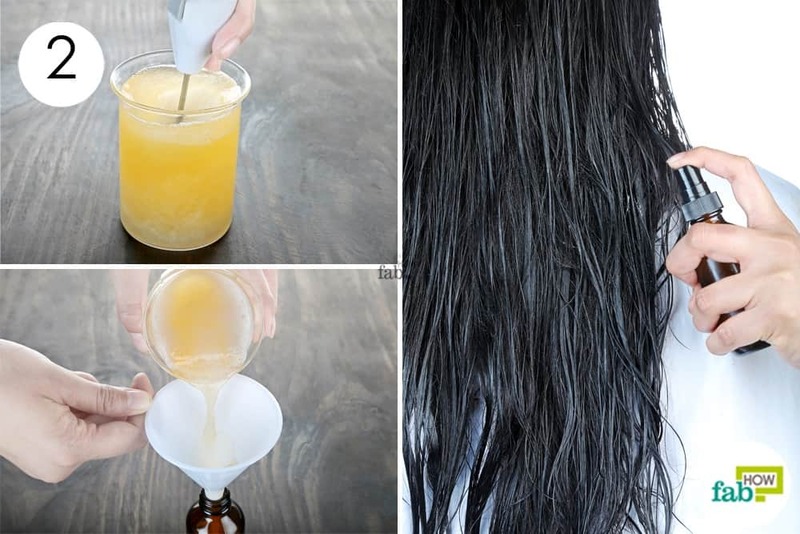 The shelf life of this DIY homemade hair conditioner is 3 to 4 months when stored in a dark and cool place. Is your hair limp at the tips and prone to breakage? 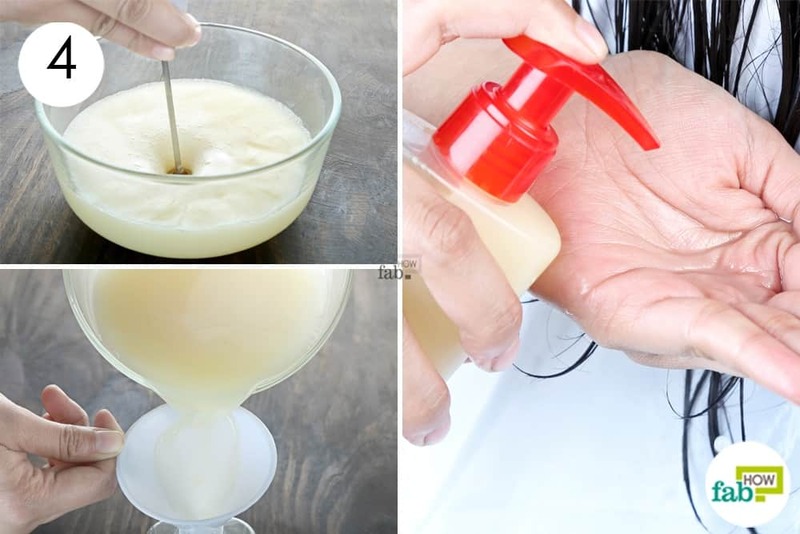 You can strengthen your hair with this gelatin-based hair conditioner. Just like eggs, gelatin helps fill the keratin gaps in your hair shafts and makes it stronger. However, gelatin has an advantage over eggs, as its proteins are small enough to bind with the hair easily. This hair conditioner also has coconut oil that moisturizes your hair and also forms an antibacterial layer over it. The tea tree and rosemary essential oils used have anti-microbial and anti-hair fall properties respectively. Set up a double boiler on medium heat. 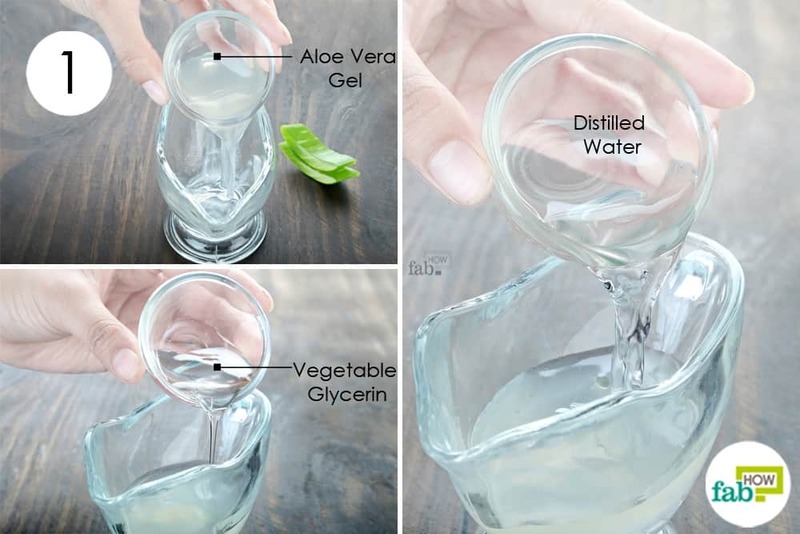 Pour ½ cup of distilled water into the glass bowl. Let the water warm up a bit, then add 1 tablespoon of gelatin crystals. 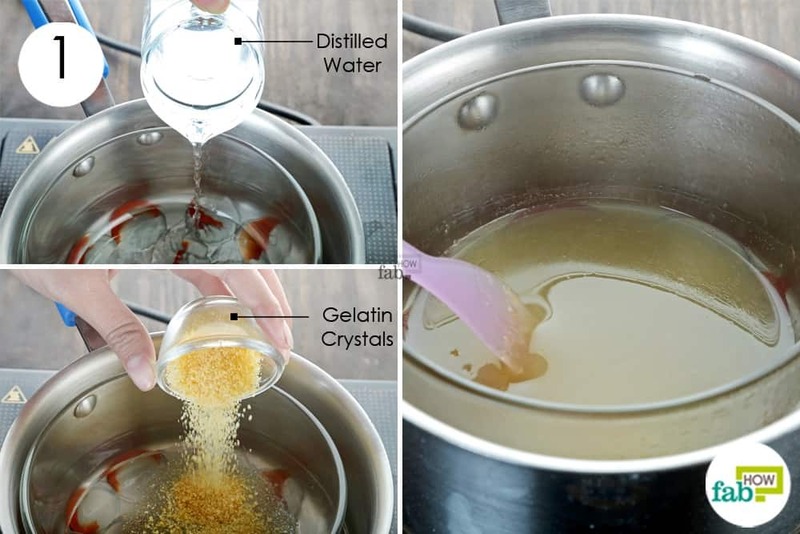 Stir continuously until the gelatin dissolves completely in water. 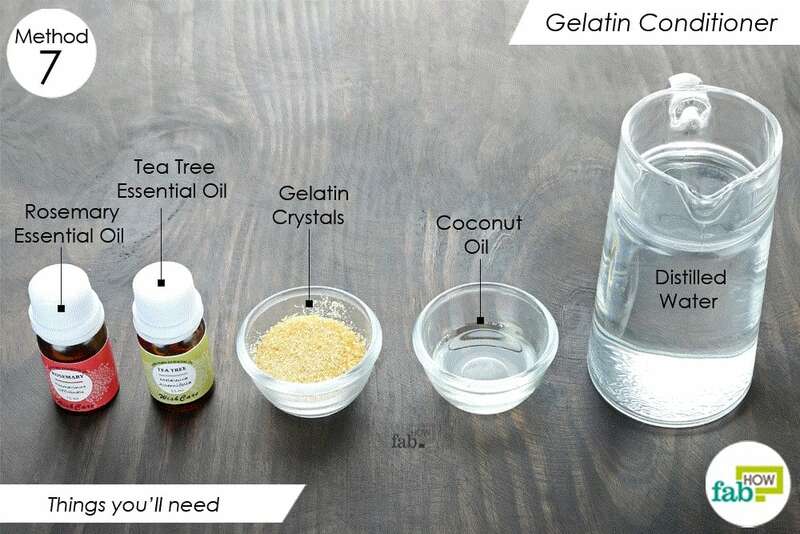 Once the gelatin dissolves, add 2 teaspoons of coconut oil. Use a motorized blender to mix it well, then remove the bowl from the heat. Let the blend cool down a bit. Add 10 drops each of tea tree and rosemary essential oils. 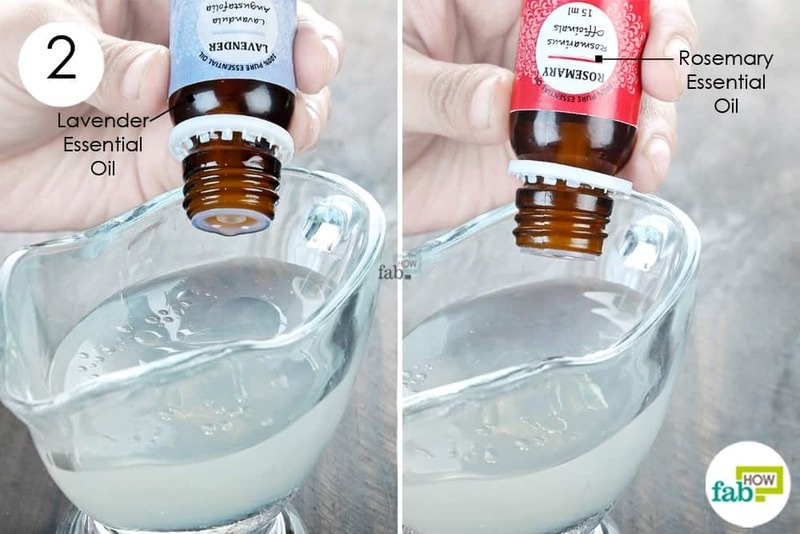 Add ½ cup of distilled water to dilute the blend. Mix everything well using a motorized blender. Pour the blend into a pump bottle to store. 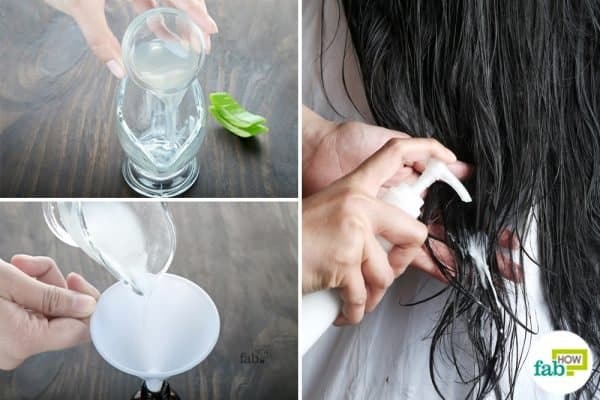 Wash your hair normally, then apply this conditioner all over your hair. Wait 5 minutes, then rinse it out. Use it once or twice every week to strengthen your hair and give it a healthy shine. The shelf life of this DIY homemade hair conditioner is 3 to 4 months when stored in a dry and cool place. When using any egg-based hair conditioner, do not wash your hair with warm water as it will cook the egg and make it difficult to rinse it out. 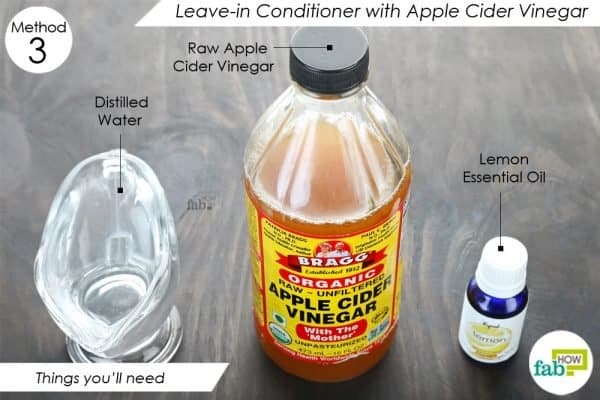 Diluted apple cider vinegar can also be used as a final rinse after using any of the above conditioners. 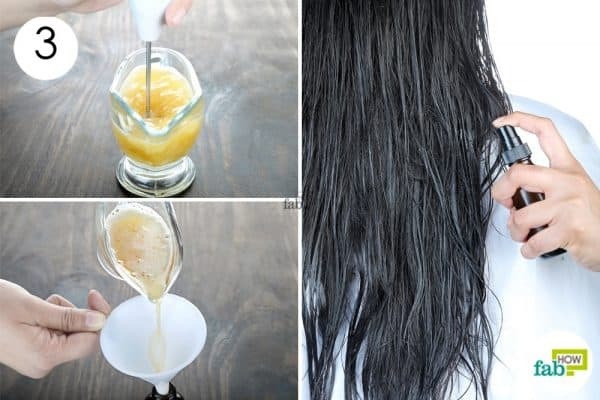 This will help keep your hair soft and shiny. 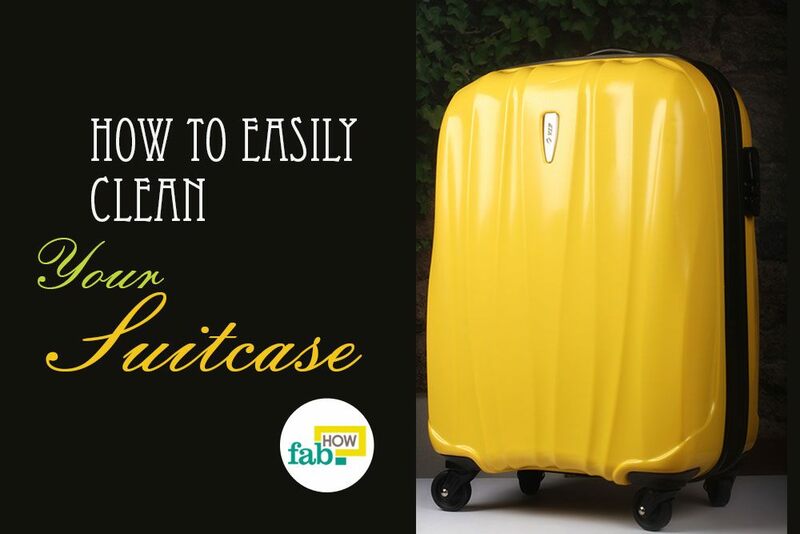 Alternatively, you can also use a rinse with plain water with a few drops of lemon. 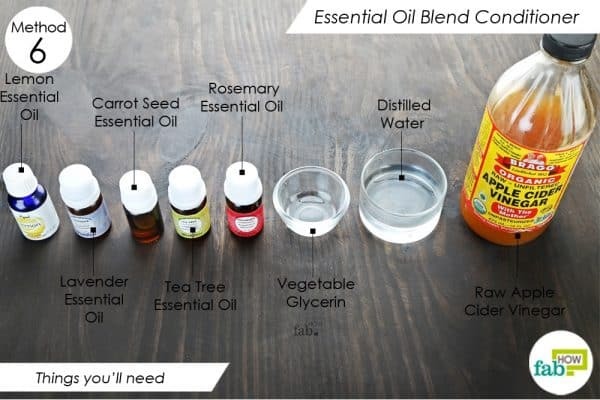 You can also check out our DIY hairsprays and homemade hair serum recipes to keep your hair protected throughout the day.